While Greyhounds as a breed tend not to suffer from the arthritic degeneration of the hips to which other large breed dogs are prone, they do appear to have a higher than average incidence of spondylosis deformans, or arthritis of the spine. In this condition, bony spurs called osteophytes form around the ends of vertebral segments, as if trying to bridge the disc space. This occurs particularly in the lumbar vertebrae (the lower back, behind the ribs). This is due primarily to two factors. First, the segments of the spine associated with the ribs are supported by a connective tissue band that runs from the top of the rib on one side of the body to the top of the same rib on the other side. The band of connective tissue acts to stabilize that spinal segment and the associated intervertebral disc, making the thoracic spine much less susceptible to degeneration. Second, the lower back of Greyhounds is subject to tremendous strain in flexion and extension during racing, as the back arches and flexes to extend the length of the stride. This predisposes Greyhounds to premature degeneration of the discs between the vertebral segments of the spine. The body then responds to pain at a particular intervertebral space by trying to stabilize that space with new bone, creating osteophytes. As a result, Greyhounds from middle to old age commonly have pain along their lower back, loss of muscle tone to the hind legs, and weakness or loss of neurologic function to the hind limbs. The Greyhound’s human companion may describe this as an unwillingness to go up and down stairs, get up on the couch, or jump into the car. Alternately, wobbly hind legs, occasional stumbles and falls, particularly with the rear end going down, or scuffing and toe dragging of the hind feet are other manifestations of spondylosis. Veterinarians diagnose spondylosis by outlining a history of hind limb disability, by physical exam of lower back pain, observing muscle wasting in the hind limbs, and by noting scuffed rear toenails and/or loss of the dog’s knowledge of its hind feet and their position in space. This is called conscious proprioception. A simple test for this reflex is done by supporting the dog’s weight while turning first one, then the other hind foot over so the tops of the toes are in contact with the ground. Normally, dogs will immediately correct this abnormal stance. Radiographs (x-ray images) of the spine are also critical to confirm spondylosis deformans, as well as gauge its severity and pinpoint the vertebral segments are involved. In severe cases, where there may be compression of the spinal cord or nerve roots by osteophytes, a myelogram may be recommended to isolate the area of compression. A myelogram is a radiograph taken after dye has been injected into the space around the spinal cord. Surgical decompression may be required to return nerve function to the hind limbs. In most cases, treatment is a matter of adequate management of the individual Greyhound’s disability, as there is currently no way to reverse the effects of spondylosis deformans. Anti-inflammatory agents such as aspirin, RimadylR, EtogesicR and glucocorticoid steroids can offer significant pain relief and increased mobility to dogs with relatively mild degenerative changes. Nutriceuticals such as the chondroiten sulfates, glycosaminoglycans, perna mussel, and shark cartilage can increase the viscosity of the small amount of synovial fluid that exists within the intervertebral spaces, as well as increasing the health of cartilage covering each vertebral segment. This can slow the continued degeneration of the joint and give comfort and greater mobility to the dog, but oral forms of these compounds take a long time to achieve an effect — perhaps as long as six weeks or more. There is an injectable form of glycosaminoglycans called AdequanR that takes effect more quickly and is widely used in performance horses. In older dogs with significant loss of muscle mass in the hind limbs, and associated weakness and falling, anabolic steroids are sometimes used to help maintain muscle mass and strength. Anabolic steroids, however, can also increase the mass of the heart muscle, sometimes to the point of disease, and so must be used with care. Finally, some dogs with spondylosis deformans achieve pain relief and increased mobility with the use of acupuncture. In my experience, the most improvement is seen in dogs with mild to moderate disability, while those individuals with severe muscle wasting or loss of nerve function to the hind limbs respond less dramatically. 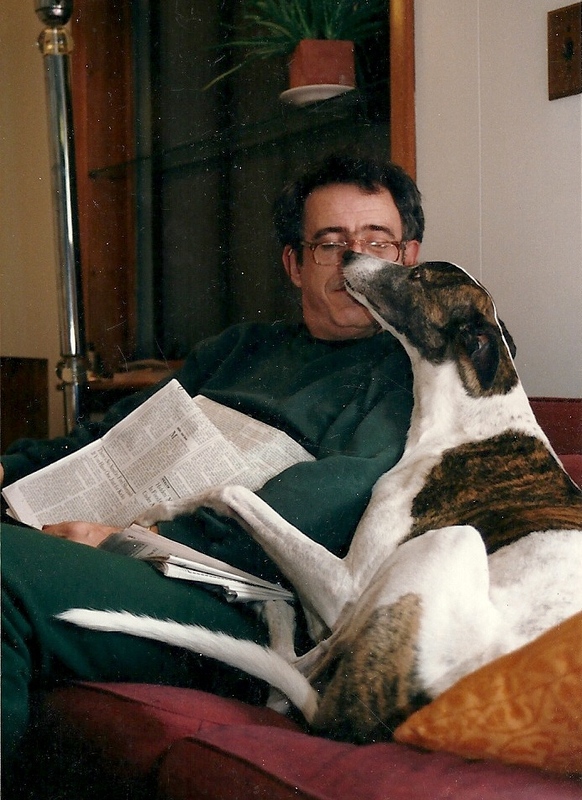 Dr. Carter wishes to dedicate this article to the late Chaucer Herman, a Greyhound who had this disease. Editor’s note: Chaucer was helped immensely by acupuncture administered by Dr. Carter.